We decided to hold a prize draw in an endeavour to collect business cards. Our investigations showed that men were more likely to choose a tree surgeon than women so we wanted to appeal to them so they’d be more likely to drop their cards in our fishbowl. After racking our brains, we decided to come up with some great prizes of holidays to theme parks. We figured that even if the guys entering the draw weren’t interested for themselves, it would probably appeal to their children or grandchildren. It was pretty successful and the guy that won second prize even blogged about us here. As expected, we found that lots of people were willing to hand over their details so we increased our database by several hundred. The jury’s still out on whether it was value for money though, as it was a pretty expensive exercise. Luckily we had contacts who arranged the holidays for a reduced rate, but even so the costs ran into thousands. On the plus side, we did get some work from the two top winners – we think they felt obliged – and it did gain us some valuable publicity in the local papers, which would have been costly if we’d had to pay for it. We decided that the key to running a prize draw is to have something valuable and unusual as the prize, which grabs attention and assures some publicity afterwards. A run-of-the-mill type of prize just wouldn’t have been so successful. As well as collecting data online as already described, we are planning a campaign to collect data in more traditional ways. If we can pick up business cards, for example, we have names and email addresses to add to our mailing list. We really will have permission to email them once, so the trick then is to ensure that we send something out that’s so interesting they will want to subscribe for further information. We want Horsham Tree Surgeons to be found all over the internet so we’re finding business directories and entering their details. There are hundreds of directories in the UK alone and must be thousands worldwide. We’ll stick mainly to local ones, although we may go for others if they come up. It would be nice if they gave a shorter link because that one has a lot of numbers – no way I’m going to remember that! Good old “copy and paste”. 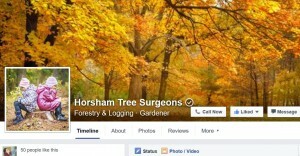 We’ve made a Facebook page for our tree surgeon case study at Facebook.com/horshamtreesurgeons. Here is a snapshot of it. As you can see, we’ve kept the same pictures and feel as the website. If you want to collect data, you’re going to need CRM software (contact relationship manager). It’s how you store and use information and allows you to email and keep in contact with your customers or anyone on your list. I’m new to all this stuff but I’m doing some research to find the best system for Horsham Tree Surgeons. So far I’ve investigated Mailchimp, which seems to be quite popular, but I haven’t got my head around whether it can be integrated into a website to collect information. More updates to come on this blog post when I find out more. I’ve been working with a local company here in Horsham, helping them to collect data to boost their business. 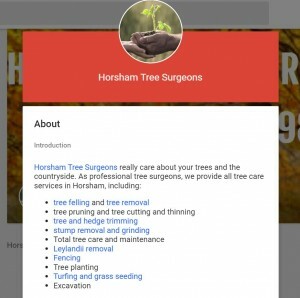 They are a tree surgery business called Horsham Tree Surgeons and we’re going to document how they go about collecting data and then how they use it to aid their marketing efforts. Check out their website to see how we’ve put a contact form on every single page, and also scattered their phone number throughout every page. We don’t want to miss any leads! It’s the in thing for businesses isn’t it? But most people still have no idea how powerful big data is and they don’t know why they absolutely must collect their own data. The old saying “where there’s muck, there’s brass” needs to be updated. Now it should be “where there’s data, there’s brass”. It may not roll off the tongue so smoothly, but believe me data is definitely worth a lot of money. It’s why Google and Facebook collect so much of it. They know what’s valuable and you should learn about Big Data too.